The Indian Agricultural Research Institute (IARI) is an institution par excellence for agricultural research and education in the country. 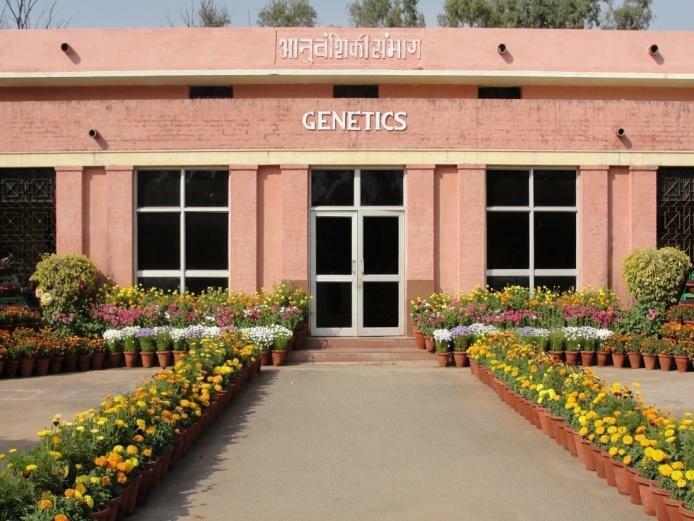 The Division of Genetics at IARI, widely regarded as the "Seat of Green Revolution" in India, is one of the important pillars of this institute. This Division has been in existence at IARI since 1960. Since its inception, the Division has been making significant contributions to basic, strategic and applied research in genetics and plant breeding of various crops as well as model genetic organisms. The leadership and vision of several eminent scientists, such as Dr. B. P. Pal, Dr. M. S. Swaminathan, Dr. A. B. Joshi Dr. H. K. Jain and Dr. V.L. Chopra, have immensely contributed to the development of the Division of Genetics at IARI as a center of excellence in teaching and research related to genetics and plant breeding. The Division of Genetics has nurtured a large contingent of post-graduate students, both from India and abroad. Alumni of the Division have either served or have been serving diverse national and international research organizations as geneticists and plant breeders of high repute. In its endeavour to develop highly trained human resources, the Division has been continuously upgrading its post-graduate education and research programmes, keeping in view the recent developments in crop genetics and breeding. IARI Regional Stations: Besides linkages with other Divisions within the Institute, the Division of Genetics has effective linkages with the IARI Regional Stations located at Pusa (Bihar), Shimla (Himachal Pradesh), Karnal (Haryana), Indore (Madhya Pradesh), Wellington and Aduthurai (Tamil Nadu), and Dharwad (Karnataka), for undertaking strategic research as well as shuttle breeding in field crops. National and International Institutions: The Division of Genetics has linkages and networking with national institutions as well as highly reputed international research institutions for strengthening research programmes in mutual areas of interest. These linkages have also immensely contributed to human resource development in the Division, particularly in the frontier technologies. Laboratory Facilities : Besides "Quality Assessment Laboratories" for cereals and oilseeds, the Division has well-equipped laboratories for undertaking molecular breeding. The equipment include Ultracentrifuges, High speed refrigerated centrifuges, PCR machines, Spectrophotometers, Densitometer, Ice-Flaking Machines, Deep Freezers (-800C and -200C) etc. The Division also has Light and Fluorescent Microscopes with photographic facilities, Stereozoom Microscope, Micromanipulator, and a Dark Room for microphotograph development and printing. Generator and UPS facilities are also available for back-up of equipment. Computer Cell : Computers with internet connectivity and multimedia facilities that cater to the needs of scientists, administrative staff and students. Divisional Library : Has a valuable collection of more than 2000 books in genetics, cytogenetics, plant breeding, molecular biology and biotechnology, besides journals, Annual Reviews, Newsletters and reprints of publications by scientists of the Division. Divisional Museum : A Museum highlighting the research and teaching achievements of the Division of Genetics since its inception in 1960. Seminar Hall : Air-conditioned Seminar Hall with modern audio-visual facilities such as LCD Projector and electronic OHP. Technology Cell: A technology cell with facilities for a small round bench talk facilities are available. Lecture Hall /Practical Lab : A Lecture Hall equipped with OHP and a Practical Laboratory available for PG teaching. Common Facilities: Photostat and electronic duplication facilities available for meeting the requirements of the Divisional staff. Indian Society of Genetics & Plant Breeding is housed in the Division. Indian Journal of Genetics & Plant Breeding is published quarterly by this society. Genetics Club: An official club of the Division of Genetics comprising students and faculty. It is active in organizing the B. P. Pal Lecture and Teachers day lecture. It facilitates qualitative interaction between students and staff of the division.